With that disclaimer out the way, I have to tell you about a trend I’ve noticed during my urban hikes. People are too quick to reach for a jacket when the weather isn’t even the slightest bit cold. On August 18th it was 84 degrees in downtown Seattle. People were wearing layers and coats. I almost couldn’t believe my eyes, so I took a few photos. The photo below was the best. I smudged his face to protect his privacy. 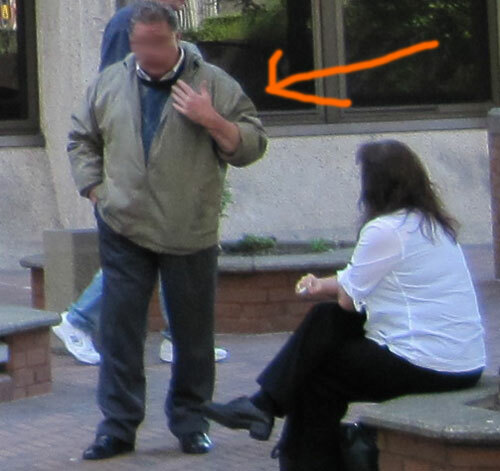 This guy is wearing a coat, which is covering a sweater, which is covering a collared shirt, which is likely covering an under shirt. Again, it was 84 degrees in downtown Seattle. There was no breeze. He wasn’t alone. Every block I walked there was someone else wearing coats and layers. Some were tourists, some were clearly office workers. Why are people so cold these days? I don’t think you have to protect his privacy. For 1. He is out in public therefore he is subjecting himself to public photos, 2. He is not doing anything embarrassing, 3. He is wearing a jacket in a typically cold city by the water. I consider #2 to be embarrassing. I hate the cold as much as anyone I know. Cold is a word that synonymous with pain in my vocabulary and I look forward to the day when I can retire to some place in a perma-warm climate. Having said that I go out for my weekend walks early in the morning and recently it was around 60 degrees. I’m in cotton shorts an an old t-shirt and see folks regularly in full layers with coats and I’m baffled. I’ve even seen people running with jackets on at this temperature. Baffling. Because even at 60 degrees I can work up a thin layer of sweat at my brisk walking pace.